Since 2015 European University Viadrina has been hosting annual international Ukrainian Summer Schools. This year it will take place in the format of BorderLab, offering multiple theoretical and practical insights into the concept of borders and border regions. Despite the strong material and geographical connotations, the idea of border(ing) often becomes the centerpiece of a (constructed) political identity which usually encompasses a variety of temporal and spatial aspects. The concept of BorderLab was designed specifically in order to create a suitable framework for tackling this phenomenon in all the diversity of its empirical manifestations and methodological approaches. The school will start with a seminar of Hannes Krämer and Dominik Gerst (both Frankfurt/Oder), who will elucidate the concept of borders from various theoretical perspectives. The way borders materialize in the urban context will be the focus of the next seminar offered by Vasyl Cherepanyn (Kyïv). Besides that, a whole block of seminars will be devoted to the problematics of borders in the region of the EU’s Eastern Partnership initiative. It will open up with the keynote lecture of Professor Karl Schlögel (Berlin, Frankfurt/Oder) that will shed light on the meaning of borders in the post-Soviet space. Susann Worschech (Frankfurt/Oder), in her turn, will be speaking about the transformative dynamics of europeanization in that region. Special attention within this block will also be paid to the role of (symbolical) borders in various regional conflicts. While in the lecture of Yaroslav Hrytsak (L'viv) the emphasis will be placed on the positive examples of reconciliation between Poland, Ukraine and Russia, another session with Ketevan Khutsishvili (Tbilisi) and Daria Isachenko (Frankfurt/Oder) will consist of case studies devoted to the issue of identity construction in such conflict regions as Abkhazia, Transdniestria and Donbass that will be presented by experts from those regions. Finally, participants of a separate podium discussion will be invited to share their views on the way the heritage of the Soviet past should be dealt with today in the countries of Eastern Europe. Besides the seminars, the summer school includes a number of workshops that will enable the students to obtain hands-on experience regarding the various forms of engagement with borders. The core element of this block of practice-oriented courses will be group work carried out by the participants within the framework of BorderDoc, BorderArt and BorderMedia workshops that will take place during the second week of the school. The main purpose of these workshops consists in the development of the students’ own group projects related to the topic of borders under the guidance of professional experts from the fields of documentary filmmaking, arts and journalism. Besides that, the program includes additional non-academic events that will be helpful in exploring the potential of these fields further, such as screening of documentaries followed by a discussion with representatives of the Ukrainian documentary film festival Docudays UA, a meeting with members of the local artistic initiative Słubfurt and a workshop on civic journalism in conflict zones that will be conducted by the activists of MediaLab Donbass. In addition to that, Lars Kirchhoff, Julia von Dobeneck (both Frankfurt/Oder) and Tetiana Kyselova (Florence, Kyïv) will lead a two-day workshop on conflict management that will provide valuable insights into the practice of peace-mediation. Another highlight of the summer school is the opportunity for non-Ukrainian participants to improve their Ukrainian language skills in courses of various levels, while for Ukrainian participants it will be possible to attend a German language course. Ukrainian Summer School “BorderLab” is an excellent opportunity for the students and young NGO activists not only to debate the current Ukrainian affairs through the prism of the European context, but also to analyze the problem of borders and explore the potential of border regions in the larger space of Eastern Europe. 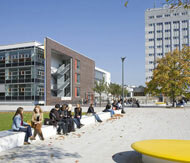 Located on the border between Germany and Poland and being itself a good showcase of fruitful transborder cooperation, European University Viadrina offers perfect conditions and favorable atmosphere for that, while the towns of Frankfurt and Słubice, which have been its home since 1991, can boast with ample empirical material for the borderland exploration.